Here is a quick quiz – what is wrong with this photograph – or more accurately what is wrong with the camera that took this photograph? I will post my next photo Tuesday and give the answer – post your guesses in the comments section. So here is the context. 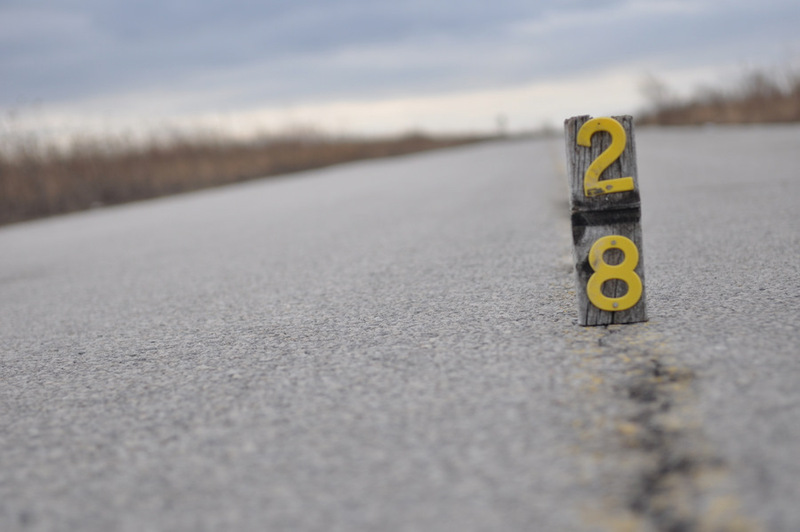 Walking along the Leslie Spit with my cousin Saturday morning, I found this piece of wood with the number 28 on and I just liked the way it looked. I placed the wood in the middle of the road, laid down in the road, set the D90 at aperture priority, selected f/2.8, and set the right focus point on the wood. My idea was to take the photo at the angle shown and use the shallow depth of field to draw attention to the number by having the out-of-focus forground and background forming a nice backdrop. It is easy to make errors in a photo like this—but in this instance none were made—if you can spot the error it is to do with the camera. I will tell you more about the issue and why I know it was the camera on Tuesday. In the mean time enjoy – even though there is something wrong with the photo – it is subtle and it is still a nice shot (in my opinion).